Nikons SnapBridge app automatically transfers your pictures to your smartphone as they are takenready for online sharing. Impress your friends with amazing pictures that capture scenes just the way you experienced themall with Nikon SnapBridge. More about the app. Compatibility: iOS 8 version 8.4 and later, iOS 9 version 9.1 and 10.1 Android 5.0 or later or 6.0.1 or later. A device with Bluetooth 4.0 or later (i.e., a device that supports Bluetooth Smart Ready/Low Energy) is required. SnapBridge 360/170 is specifically designed to enhance your KeyMission 360/170 experience, adding video playback, editing, remote camera control and sharing capabilities to a compatible smartphone or tablet±. Just like SnapBridge, SnapBridge 360/170 connects your camera and smart device through Bluetooth® low energy (BLE) technology so your adventures can be transferred as theyre takenready for editing and online sharing. Compatibility: System Requirements: Android 5.0 or later or 6.0.1 or later, iOS 8.4 or later, iOS 9.1 or 10.1 (latest version of iOS 8 or iOS 9 recommended). A device with Bluetooth 4.0 or later (i.e., a device that supports Bluetooth Smart Ready/Low Energy) is required. The Wireless Mobile Utility wirelessly connects your compatible iPhone®, iPad® and/or iPod touch® or Android powered device to Nikon digital cameras, letting you download photos, take pictures remotely, and share them hassle-free via e-mail or upload to social networking sites. The Wireless Mobile Utility app is used with select Nikon digital cameras that feature built-in Wi-Fi® connectivity as well as specific models that are compatible with the WU-1a or WU-1b Wireless Mobile Adapters. More about the app. Compatibility: Requires iOS 6.0 or later. Compatible with iPhone®, iPad®, and iPod touch® and Android. This app is optimized for iPhone® 5. The Wireless Mobile Utility application must be installed on the device before it can be used with the camera. Compatibility: Requires iOS 8.0 or later and Android 4.0 or higher. Compatible with iPhone®, iPad®, and iPod touch® and Android. This app is optimized for iPhone® 5. 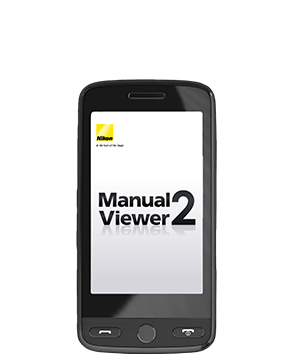 Download and view manuals for Nikon DSLR cameras with the Manual Viewer 2 App. Access the instructions at any time, online or offline. Simply tap a manual in the library to launch the viewer. Links are indicated by colored text: tapping a colored word or number takes you to the linked page. Compatibility: Requires iOS 8.0 or later and Android 4.0 or higher. Compatible with iPhone®, iPad®, iPod touch® and Android. This app is optimized for iPhone® 5. 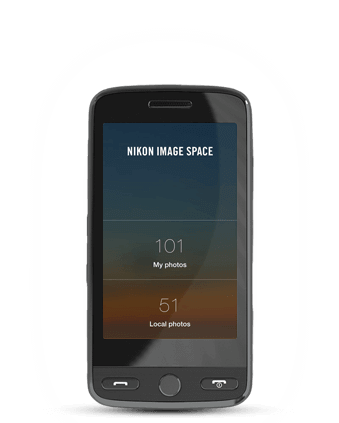 Nikon Cameras having built-in NFC capability can only be used with a compatible smart device running on the Android operating system version 4.0 or higher. For compatibility and specifications regarding Wi-Fi® compatibility, please visit en.nikon.ca/wificompatibility.